Tattoos have been around for literally thousands of years. There were tattooed mummies found in ancient Egypt, after all. Considering how long ago that was, it makes sense that a few mistakes have been made along the way. Not every tattoo artist is a genius, after all. There are a lot of really great ones who know their stuff, but there are also those who simply do not. Furthermore, a lot of ideas for tattoos are not so good. The artist might try to tell the customer that, but a lot of people are stubborn. They want what they want, and they will not have things any other way. Some people just will not listen to reason. Therefore, as a result, you see a lot of people out there walking around with tattoos that are just awful. You also notice there are obvious grammar and spelling mistakes—you really have to wonder how those managed to slip by. Here are fifteen examples of really regrettable tattoos. The message of this one is nice, true. People should avoid sinking—physically and emotionally. It is sad to learn that the young woman in this image went through hard times. 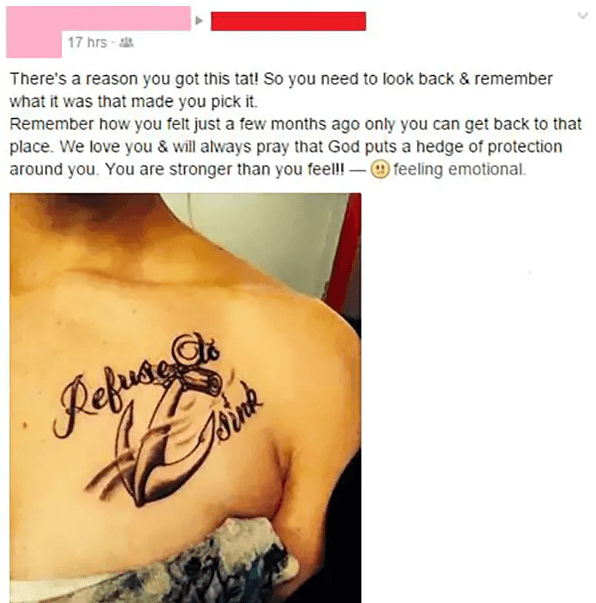 A lot of people often get tattoos to remind themselves of the fact they got through a difficult period in their life. That is great. She refuses to sink. Unfortunately, as one person pointed out, anchors are definitely designed to sink. She should have gotten almost any other image to accompany the text. A life preserver, as pointed out, would have worked. A boat probably would have been the most obvious, recognizable choice. The message was good, and honestly the anchor was drawn well; but the two combined images cause you to scratch your head. It is nice to see how loved the young woman is, though. That’s the nice thing. I played a little music back in my day, so I knew I recognized that tattoo. As someone pointed out below the image, that does not mean powerful soul. If you are an artist, you should absolutely get clefs and musical notes or pictures of your favorite instruments tattooed on your body. Do whatever you want—it is your skin. However, don’t go around telling people symbols—common ones—mean something that they actually do not. I wonder if the person who got the tattoo regrets it now. With any luck, the person is a musician. 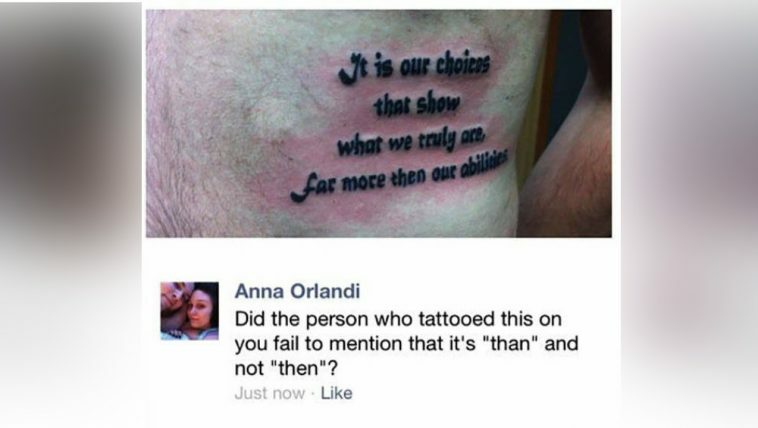 If you are going to get a tattoo, you should probably make darn sure the tattoo’s grammar is correct. Let’s be honest here: grammar is not everyone’s strong point. One day, we might live in a world where pedantic people do not point out every single grammar mistake you make. However, we are not yet living in that world. 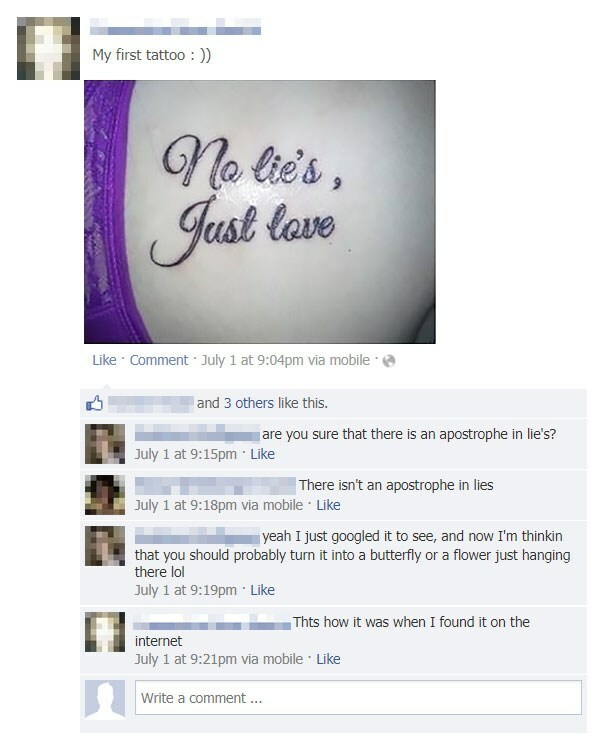 While the advice to cover up the apostrophe is good, someone should have advised this woman not to get tattoos “off the internet”. Is she unfamiliar with how terrible grammar on the internet is? Even when people are trying to write really well, mistakes pop up. You will find articles written by some of the top journalists in the world, and they will contain typos and grammatical errors. The image of this tattoo should have been sent off to friends and family before it was inked on her body. If the person who got this tattoo was Jewish, this would make a little more sense. Judaism is interesting for a number of reasons. It is, after all, one of the world’s oldest monotheistic religions. The Star of David (which is known in Hebrew as the Shield of David) is typically considered—these days—a symbol of Jewish Identity and Judaism. 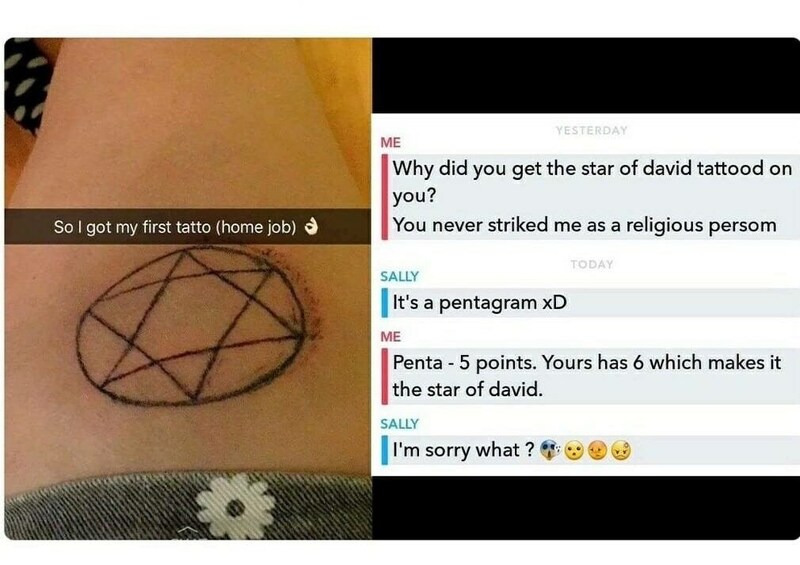 Sally, the person who got the tattoo, did not want The Star of David. Sally wanted a pentagram. While they sort of look similar, they represent two very different things. Sally really goofed on this one. That’s why she probably should have went to a professional instead of doing a home job. Pentagrams were used as symbols in ancient times; nowadays, though, they are frequently associated with Wiccans and other Neopagan faiths. Pentagrams are also associated with Freemasonry. It is really important, in life, to acknowledge your own shortcomings. If you do not do so, you’ll never reach your true potential. You will spend a lot of time chasing things that you probably should not be chasing. In this case, the tattoo artist should probably admit that he or she just is not very good at art. 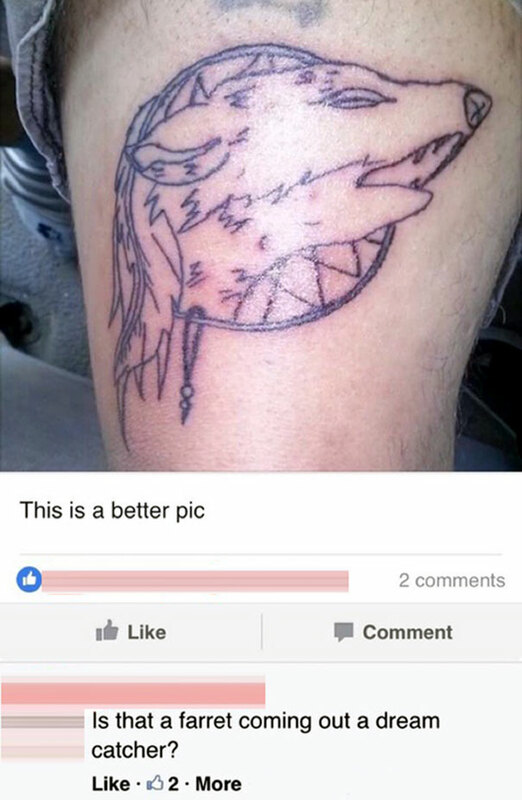 The person who made the comment is right—the wolf actually does look more like a ferret. The comment about the dream catcher is pretty spot on, as well. I really wonder if this is another one of those tattoos someone did himself or herself. Aesthetically, this tattoo is a lot nicer than a couple of the others we’ve seen on this list. I can see why people might be confused, though. That does look like a log or a stump. It kind of looks like a cross—I can definitely see it—but it also looks more like a log or a stump. To be fair, as someone pointed out, the cross was made from wood. 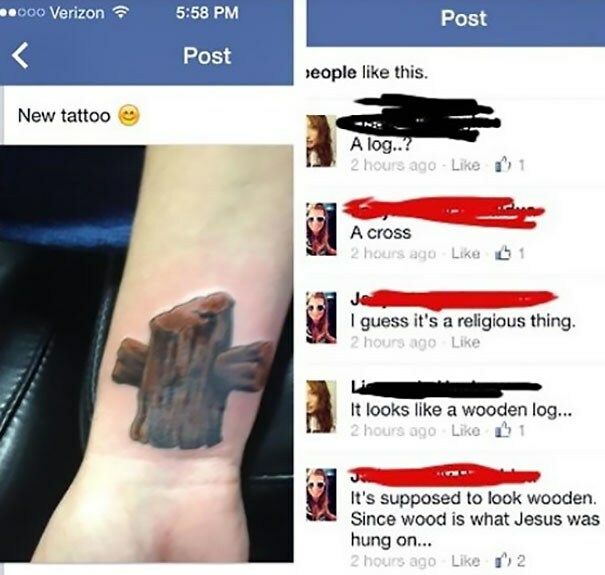 Therefore, I suppose the cross resembling a log or a stump makes total sense. The whole thing could just be a little clearer. 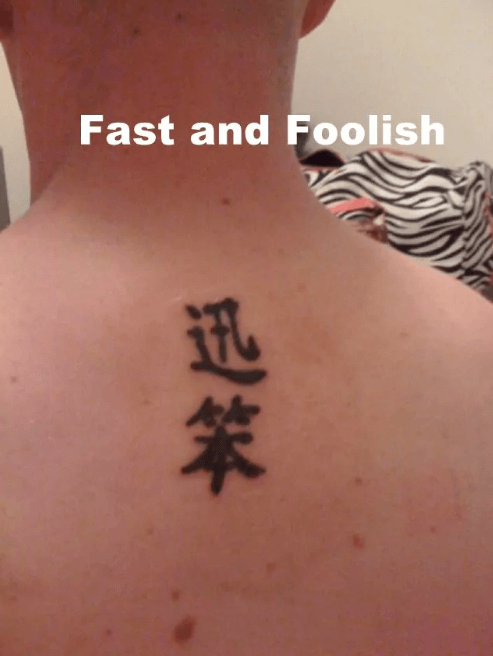 There is a lesson to be learned from this tattoo. Actually, there are a couple things to learn. 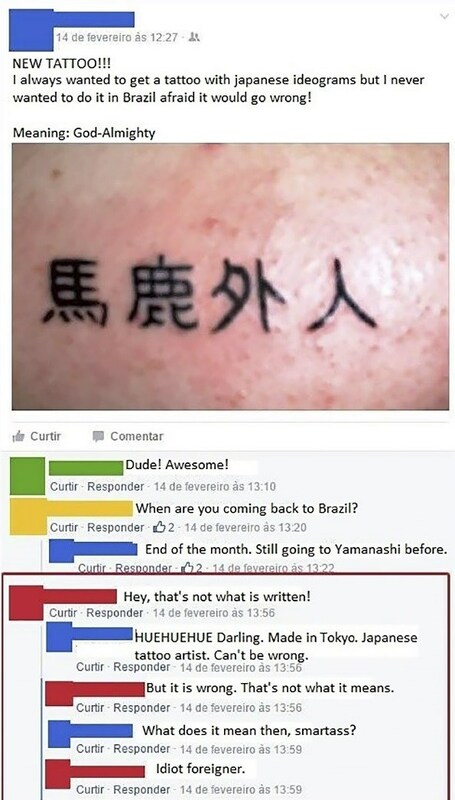 The first lesson is that you can’t always trust tattoo artists—regardless of what country you are in. Actually, you might want to trust artists from foreign countries much less. 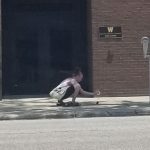 If you get a tattoo down the road from where you live and the artist messes up or writes something nasty, you can force the artist to fix it. You can even take legal action if need be. If you get a tattoo thousands of miles away from where you live, unless you are some sort of jet-setting millionaire, you are probably out of luck. I guess the second lesson here is that there are a lot of Japanese tattoo artists who are not huge fans of tourists who visit their country. This one may be an exception, true, but that seems unlikely. Whatever the case may be, this artist did not like the person getting the tattoo. If you call someone an “idiot foreigner”, you are not a big fan of that person. In the tattoo artist’s defense, though? 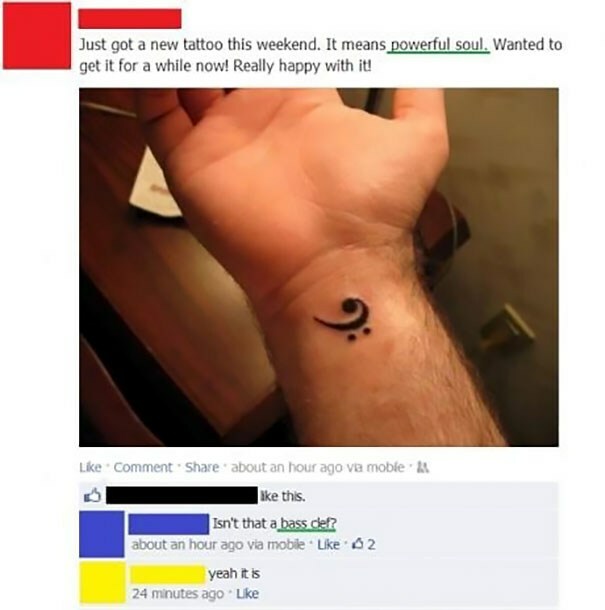 The person getting the tattoo might have been a complete and total jerk. I am not saying he deserved what he got—let me be clear—but there may be an explanation that goes beyond a dislike of foreigners. Here is another example of a tattoo with an incorrect apostrophe. Seriously, people, if you are going to get a tattoo, get the grammar checked. Don’t rely on the internet, either. Ask your parents or bosses or co-workers. In fact, you should ask everyone you possibly can to look at a design before you get it inked on your body. The message of this tattoo is nice, really. 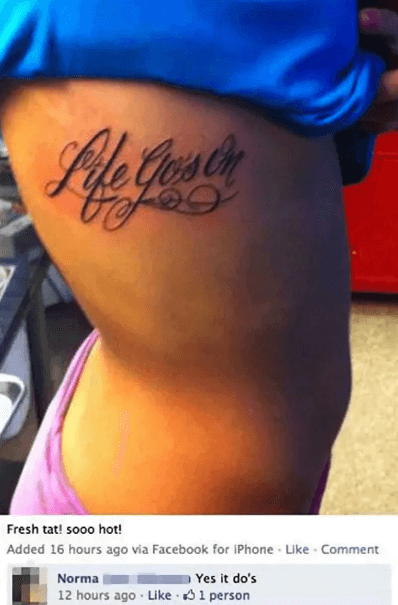 Life does indeed go on; in this person’s case, that life will probably involve painful and expensive laser tattoo removal. Norma’s response at the end is a classic. 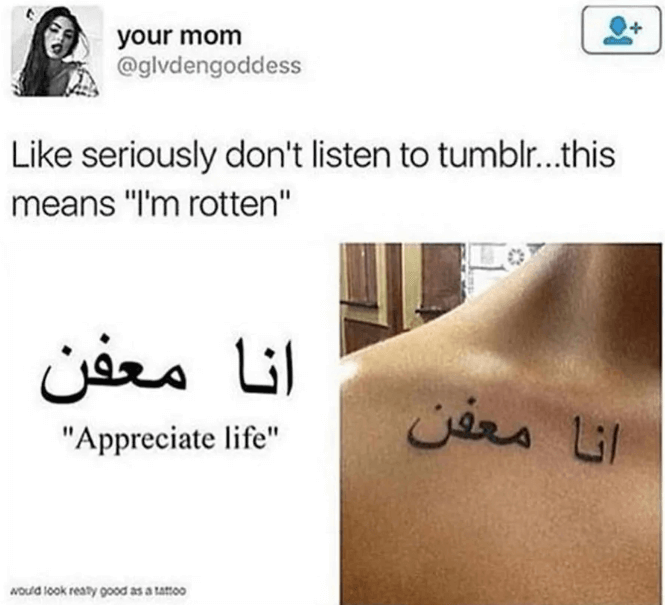 If you go to Tumblr for translation advice—and rely only on Tumblr—you probably should not be getting tattoos. Get second and third opinions. People frequently get second and third opinions from people about what to wear out on Friday nights, after all. Clothes can be taken off. Why on Earth would you get a tattoo without getting a second and third opinion? It must be pretty disappointing to think you’re getting a tattoo that reads “appreciate life” only to find out that you are publicly stating that you are rotten. Was someone on Tumblr having a bad day? In case you are not aware, Tumblr is a social networking site and microblogging website. It has been around for 11 years now, and it currently hosts well over 400 million blogs. Well over 500 million people visit Tumblr every year. 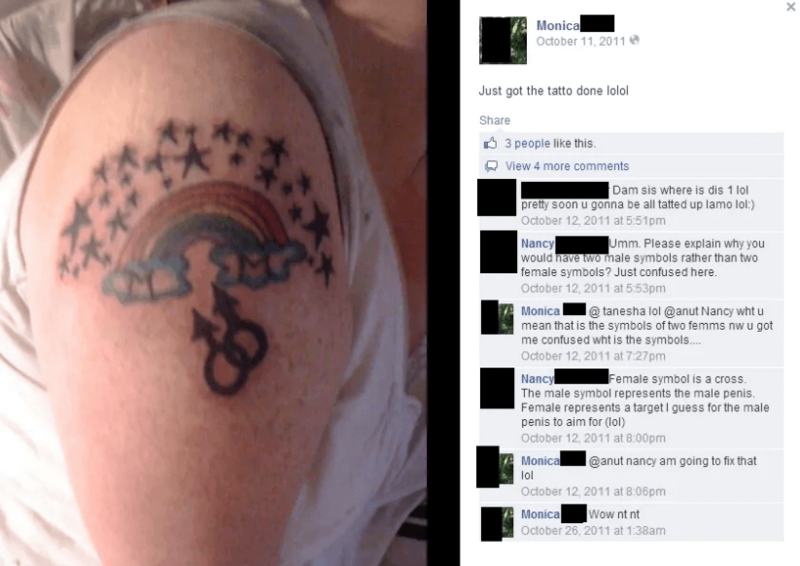 So if you read the conversation, it becomes perfectly clear that Monica wanted two female symbols. However, what she got instead was a tattoo of two male symbols. Monica is probably only laughing about the whole thing because she is extremely embarrassed. I would be, too. She will probably try to get the whole thing fixed. That will not be a cheap or easy process, I am sure. It is important to be patient with people. Kindness is a good thing. Over the years, you tend to meet a lot of people who have a truly remarkable ability to get under your skin. The word “patience”, though, is not spelled “patients”. As far as I know, it never has been. 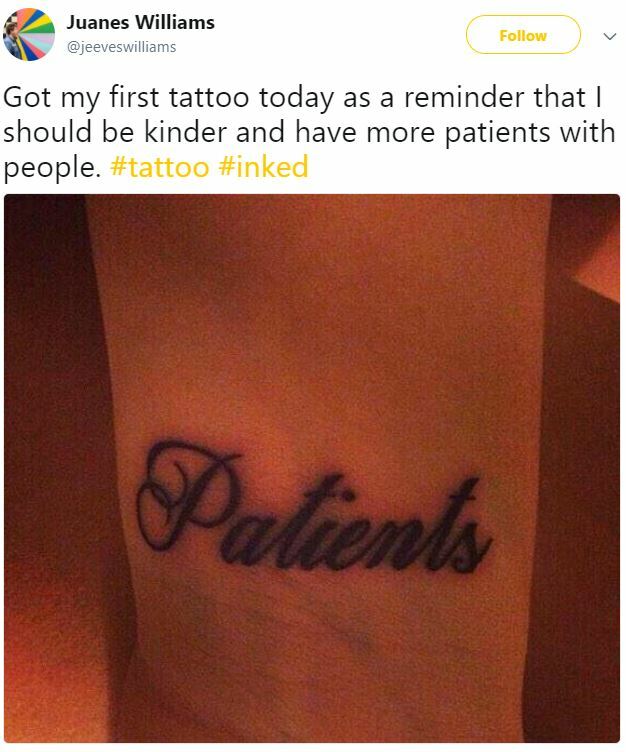 I suppose the person who got this tattoo is a nurse or a doctor and needs to be reminded to be more patient with the patients? That seems like a pretty big stretch, though. Once again, you should always have another person or two proofread your tattoos. If you don’t, you could end up making a huge, costly, painful mistake. This is another poor translation. I am assuming it was not intentional, but it may have been. We’ll never know. We will also really never know what the owner of this tattoo wanted to say. Obviously, “Fast and Furious” comes to mind. 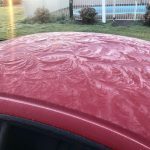 He could be a big fan of “The Fast and the Furious” movies. That would not be a surprise—when you consider how many of them have been made. 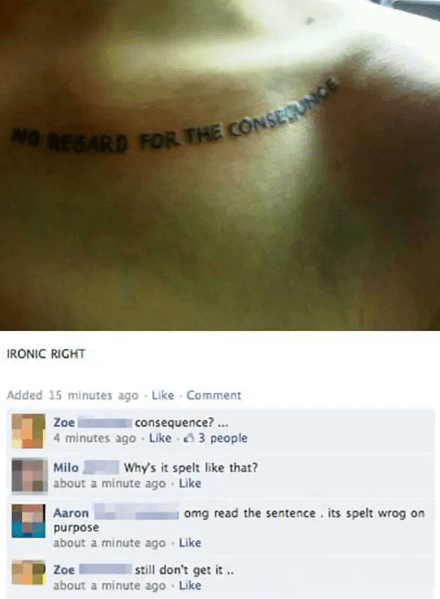 Obviously, the word “consequence” is spelled wrong in this tattoo. According to Aaron, it is spelled wrong on purpose. I am not sure I completely and totally believe that. That seems like something someone might say just to save face. However, if it was intentional, it is pretty funny. Getting something tattooed on your body in order to make a joke seems a bit extreme, and he may regret that tattoo in five years. However, you also have to admire true commitment to a joke. After reading through this list, you sort of have to wonder if people shouldn’t think a bit harder about getting tattoos in languages they can’t personally read or write. If you have a close personal friend who can, and they are willing to come with you to the parlor, that’s fine. You should be safe. There have just been way too many nasty pranks played, and certain tattoo artists really seem to resent their clients. 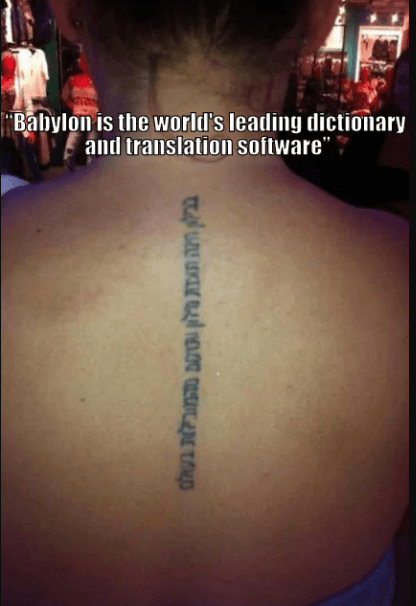 The fact that this tattoo is basically a walking advertisement for a dictionary and translation service is hilarious, though.